but the love that goes into making them is..."
I've sat through many a guild meeting or bee night where a gal proudly stands to reveal her latest creation, and instead of stopping with the "Ohhhhs!" and "Ahhhhs! ", feels duty bound to point out every last "mistake" in the quilt. There's really no need, for there are few things in life where one can achieve true perfection. Simple math problems come to mind..."2+2" has a perfect answer..."4". Baking a cake. Sure every recipe has "correct" measurements, but small deviations still result in a tasty morsel that'll be gratefully gobbled down. DO...TRY...GROW as a quilter, as a person. Enjoy the process. Learn new techniques. Revel in creations wrought by your own hands. They are unique and an expression of YOU. And for that, there need be no apology! for we shall never cease to be amused. If it's perfect, will it get used? Puts things into perspective, doesn't it! The quilter is only identified as Mary, but she is as amazing as she is prolific. I especially love her Lone Star quilt with the blue background and scads of LeMoyne Stars. Let me know what you think! Every three years Quilters Newsletter Magazine, in cooperation with the International Quilt Market and Festival, commissions this quilting study to take a snapshot of the quilting world. The U.S. quilting market is still growing, despite the troubled economy, with quilting households spending an average of $219 in 2010 up 27% from the 2006 study. What I, as a quilter, am most interested in, is how I stack up against the dedicated quilter, one who the study defines as a quilter who spends more than $600/yr on quilt related purchases. I think of myself as a dedicated quilter, do you? The survey determined that a dedicated quilter in the U.S. is a 62 year old female who is well educated (72% attended college), rather affluent with a $91K household income and spends an average of $2,442 a year on quilting. Well, that looks to be as different as each quilter. 44% prefer traditional quilts, while 50% enjoy both traditional and contemporary quilt styles. And she knows what she likes and what she's doing, because she's been quilting for an average of 16 years. In her quilt studio (and 85% have a dedicated room for quilting) she's got an average of $8,542 worth of tools and supplies tucked away (not including fabric). A DQs stash contains about $3,677 worth of fabric. She's becoming a thread aficionado, spending an average of $144 last year on thread. Her collection includes an average 153 spools. And she's warming up to using the computer for quilting, spending an average of 2 hours a week on quilting websites looking for free quilt patterns, learning about quilting products, finding supplies, and buying fabric. Dedicated quilters represent only 6.2% (yeah, that's all!) of the 21,300,000 total quilters in the US, but we account for 69% of all quilt-related spending. We know what we like and what we want, and are willing to spend to add it to our Quilters Resource Center (yes, I'm talking about STASH...fabric, tools, thread...all of it). Let your local quilt store know what you like! If you see a pattern on the internet, see if your LQS can get it for you. Same goes for fabrics, threads, notions, battings, etc. If they know what you're interested in, and that others are interested as well, they absolutely will do their best to carry it. A dedicated quilter is a powerful gal! OK, there's nothing in the survey about how many quilters are perfect quilters, but here's something to think about when nothing, absolutely nothing, is going together right. The US population is about 310 million. There are about 21.3 million quilters in the US. Let's assume, that I'm the worst quilter in the world. No matter how imperfect my quilts, I'm still a better quilter than the 278,300,000 people in the US who haven't even tried to make a quilt! This newsletter is for YOU. So your input is very important to us! If you have comments, ideas or feedback, we'd love to hear from you. Suggestions for topics to cover or general questions. We're all ears. Please Contact Us and tell us what you think! For questions about quilting, you can ask them in our Machine Quilting Forum. Machine applique questions are answered at Machine Applique Questions...Answered. Have you scene the fabulous quilts our visitors have contributed? If you're into lots of pieces and beautiful quilts, you are in for a treat! Since our last issue, our online Show and Tell has grown by 26 quilts. Is your quilt included? 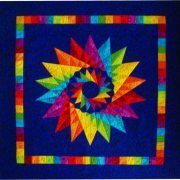 If you have a quilt to share, add it to our Share Your Quilt page. It's easy to do and fun to see your own quilt, live, on the Internet! I'd love to hear what you think about this subject! Share your tips and thoughts. I'll reply as soon as I can! ...the winners from the quilt show in Paducah! See them by clicking here to visit the Generations Quilt Patterns Facebook page.